The President's statement on U.S.-Saudi relations has caused understandable upset and predictable uproar. Most of these reactions are explicitly framed in terms of values. They need not be. 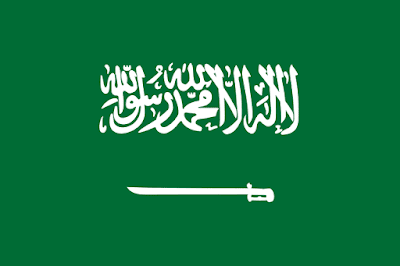 The house of Saud does not strengthen America. To the contrary, Saudi demands sap American strength and cloud American focus. Our relationship with the Saudis is one of the greatest threats to the safety and power of this nation. Strategy is about setting priorities. It demands focusing on some problems at the expense of others. For two decades we have put the problems of the Saudis and their region at the forefront of American policy. We have prioritized the needs and insecurities of the house of Saud over the needs of much more vital interests—our "pivot to Asia" led to a retrenchment in the Middle East, in response to growing Chinese power our arm shipments to the GCC increased faster than those to the democracies of the West Pacific, and our relationship with vital nations like the Philippines and Thailand faltered while voices in CENTCOM push for an elaborate new security regime to tie the house of Saud and its friends ever closer. We must be candid about the other side of this "important strategic relationship." It has been clear publicly since 2016 that the Saudi government is implicated in the 9/11 attacks, and this was known privately for 13 years before that. The toxic ideology that inspires Salafi-jihadist terrorists from France to Indonesia is primarily a Saudi export. As the destructive consequences of this ideology have become clear the Saudis have maneuvered to protect and empower, not destroy and prosecute, those who produce it. Let us have no illusions: Riyadh has more actual American blood on their hands than any other sitting regime in the world (with the exception perhaps of the military machine run out of Rawalpindi). This was all true before the Saudis more recent and more brazen attempts to break down the rules and norms of a civilized international order—kidnapping prime ministers, killing hundreds of thousands of civilians in unnecessary wars, and so forth. If the Saudis are our ‘vital’ friends, we do not need even lukewarm enemies. There will be arguments and attempts to keep this unholy alliance in the name of countering Iran. This is sacrificing a queen to capture a rook. Again, we need to be brutally honest with ourselves about the nature of the world and our own capacity to act within it. 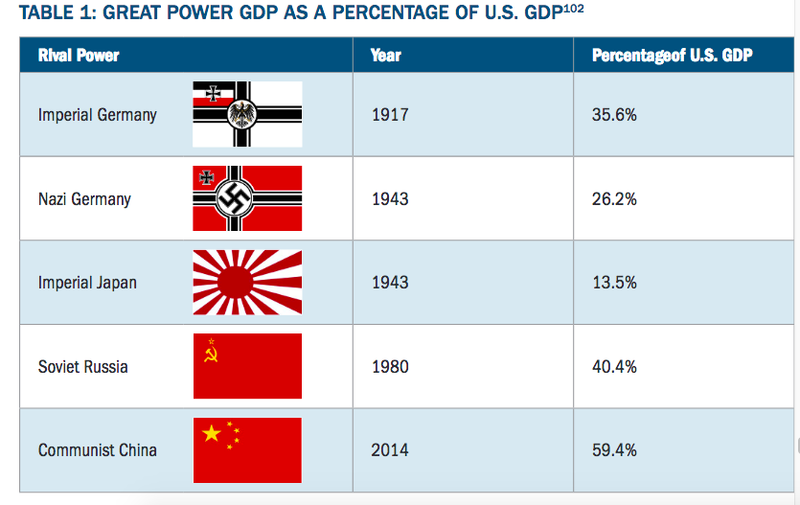 The ratio of the GDP of the United States to China in 2018 is dwarfed by the ratio of the American and Soviet economies at any point in the latter’s history. 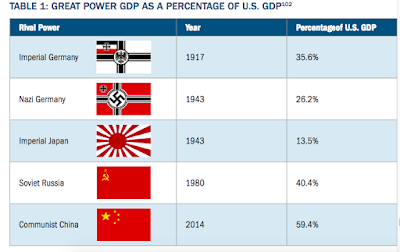 The gap is smaller than that between the GDP of the United States and the combined GDP of all the Axis Powers at the height of their empires. America's battles with those great tyrannies were won at times of fiscal integrity and national cohesion. Today's America is bitterly divided. The only thing that unites the American people is weariness with foreign wars. They put defense issues and foreign affairs at the rock bottom of their concerns. America’s government is deeply in debt. Sequestering defense budgets has become an acceptable political tactic. There is little desire to put America on a financially stable foundation. Image Source: Andrew Krepinevich, Preserving the Balance: A U.S. Eurasian Defense Strategy (Washington DC: CSBA, 2017), 39. Which is all to say: The contest with China is going to be more difficult than any geopolitical challenge we have encountered in our nation’s history. It will require our complete attention. We do not have the military capacity, political capital, or financial wherewithal to be everything to everyone. We must choose. If we decide to confront China then we must give up international distractions—or perish. The Middle East is a distraction. America will soon be a net energy exporter. The region’s oil holds no power over us any longer. It is a region defined by its poverty and backwardness. One Middle Eastern population after another has shown that they are not prepared for, nor truly desire, democracy. The Arab street is, and shall for generations be, hostile to American power and culture. The only people in the region friendly to our people or our interests—the Kurds—lost their dream of independence and have been cast aside by all powers involved, including us. The power most hostile to us—the Iranians—is growing. This causes consternation among the Arab elites. But Arab interests are not our interests. Iran’s ability to hurt American interests is directly proportional to America’s investment and presence in the region. If we were not there they could do very little to frustrate our aims. (Growing Iranian power comes with another side benefit: in the resurgent Shiite empire on their doorstep the pestilence of Salafi-jihadist terrorism will find a new and more important target than the West). Victory against the Iranians provides no meaningful gains; defeat leads to no meaningful loss. The likely outcome, however, is neither victory nor defeat, but another four decades of costly shadow war that keeps America sending soldiers to a region that does not matter to shore up despicable regimes who do not act in her interests. The Khashoggi incident is a gift. By refusing to extricate ourselves from the region we have put optics over interests. But Khashoggi's death now makes the optics of withdrawal and alliance termination easy. It will still be a hard thing to do. The American defense community has strong psychological, emotional, and financial commitments to the Middle East, and to the Saudis in particular. But this is all the more reason for cutting these ties as fast as we can. 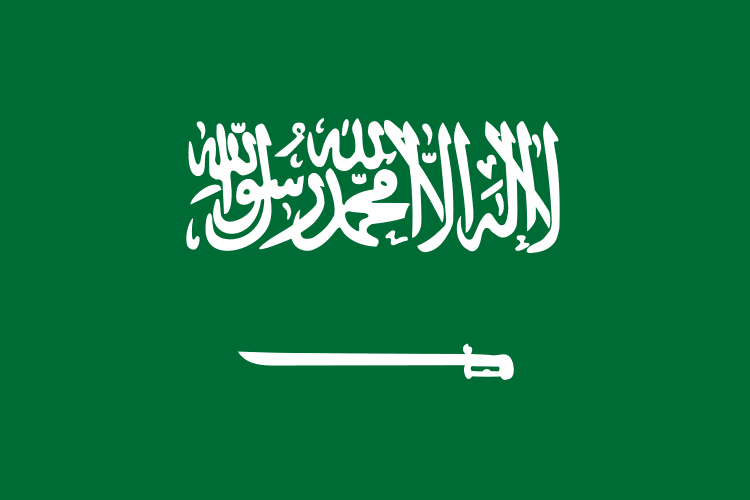 The Saudi security relationship is a quicksand trap. We must be free of it. Every dollar, soldier, and diplomat that is sent to shore them up is a dollar, soldier, and diplomat who should be engaged in what will soon be be recognized as an existential conflict with the Chinese Communist Party. This post is not the place to outline the threat the CPC poses to American institutions, the liberty of billions of free men and women across Asia, and America’s position on the global stage. For now a I will say only this: Saudi and the Iranian machinations are a minor side show to this drama—but a side show that has stopped us from acting with the focus that victory in the main show requires. The hour is late. We cannot afford another round of retrenchment in the Middle East. We should take advantage of this now, while the chance to cut ties so easily is still before us. Our President has a reputation for mercurial policy-making. This holds out the potential for a policy walk-back. On this point I am pessimistic: I believe the President's reputation is largely undeserved. For our sake, I hope I am wrong. Would be wary about extrapolating American energy independence from current trends. The decline rates in frack wells are very steep and overall the industry has burned money (read: debt) for the longest time. Those wells typically don't generate free cash flow. So things could look very different in 10 years. I have been arguing similarly for a long time. "Unfortunately, given the U.S.'s tenuous domestic challenges, the ability to save the world is no longer at its fingertips, nor is it necessarily even desired by the American people themselves. Yet, every nation has national interests that must be preserved. Chief of those for the U.S. is to not be pushed out of East Asia by a rising China. Secondary among these is to avoid catastrophic, 9/11-scale terrorist attacks on its own soil. Embracing chaos in the Middle East, paradoxical as it might seem, can, if adroitly exploited, accomplish both. Naive isolationism, naive internationalism and naive interventionism do not accomplish either. Nor will they ultimately change the bloody facts on the ground in the region." "Though conventional American foreign policy wisdom would find that a negative outcome, it could open the door to a better relationship with Russia if skillful diplomacy, as opposed to the all too-common rhetorical chest thumping, is employed. As this author has long-maintained, Russia is a critical pivot player in the great geopolitical drama of the 21st Century- the rise of China. A potential Sino-Chinese axis would be, by far, America’s greatest geopolitical problem since the collapse of the Soviet Union. Avoiding this should be of paramount importance to U.S. foreign policy makers. Strengthening Russia combined with a more productive U.S.-Russian relationship will prove indispensible to balancing China. Finally, a complete breakdown of the Middle Eastern order likely poses more problems for the U.S.’ greatest geopolitical competitor, China, than it does for the U.S. itself. China gets a greater percentage of its oil from the region than the U.S. does. " You are right about the Middle East's lack of relevance, in part. I do wonder to what extent the importance of all the oil reserves in Saudi Arabia and its neighbours can be so easily dismissed. The US may be a net energy exporter soon, but all those oil reserves are still very valuable for the world at large, including China itself. You are entirely correct of course, but nothing will change. How much money do the Filipinos, the Thais, the Vietnamese, the Taiwanese and others have to buy influence inside the beltway? Not so much How much does the House of Saud and the other Gulf princes have to buy influence inside the beltway? Plenty, oceans of money. Our national leadership can be counted on, above all else, including the fate of the Americans, to follow and serve the money.